Can you believe it? The summer holidays are over for another year, which for many self-employed, entrepreneurial and work-at-home parents, means more time to dedicate to building a successful business. 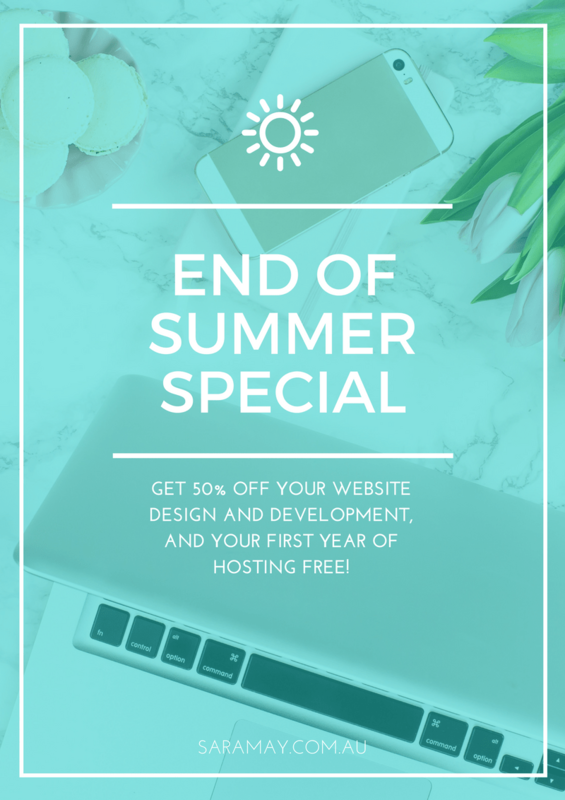 To celebrate this exciting time, as well as the launch of my refreshed website, I’m offering an insanely discounted rate on my website design and development service. Keep on scrolling down the page to find out just how affordable a custom-built website can be! Type of promotion: Discount on Web Design and Development package. How to participate: Be one of the first 4 Web Design and Development clients to book my services, before the 31st of October 2017, and secure your booking by paying your retaining deposit within 7 days of booking. Who is eligible to participate? Anyone who requires a website for their business, wedding, blog or project, that, after consultation with Sara-May, has received a proposal to engage the Website Design and Development services of Sara-May Monaghan | Digital Consultant. What’s on offer? : A 50% discount on the Website Design and Development packages offered by Sara-May Monaghan | Digital Consultant. This excludes all other services offered by Sara-May Monaghan | Digital Consultant, and cannot be combined with any other offer. Booking must be made on or before the 31st of October 2017 CEST, and the retaining deposit must be paid in a timely manner according to the terms on the invoice. Timelines for project commencement and completion will be discussed and agreed upon before services are engaged. Promoter: Sara-May Monaghan | Digital Consultant. Haagseveer 42, 3011DA, Rotterdam, ZH, The Netherlands. Disclaimers – Sara-May Monaghan can not be held responsible for injury, loss, damage or negligence as a result of participating in the promotion. No correspondence will be entered into and the promoter’s decision is final on all matters.